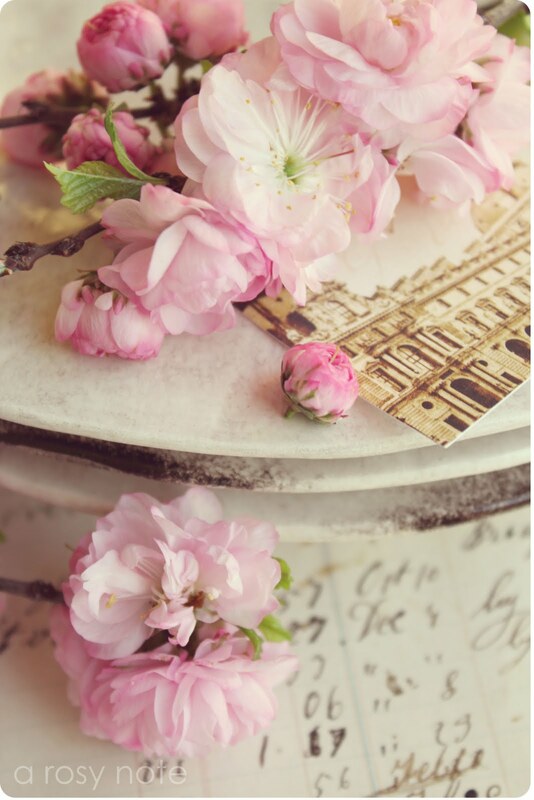 I paired them with some other little wonderful things…some fluffy pink blossoms from my plum tree, a few rustic plates and some French papers that Tracey had included in her package. I think it all goes perfectly together. Pink, brown and cream are one of my favorite color combinations…sweet, but not too much so. They’re the colors that I have been using to redo my daughter’s room. You know, the room I talk about but never show you. Someday soon…promise. What pretty mugs. I can't believe you still have blooms. But I guess you guys get a later start then us. I miss the pink fluffy flowers! …so YOU'RE the one who won her pretty mug giveaway!! How lovely…you are right brown and pink look wonderful together and you have put them together to bring out the very best. Beautiful! Beautiful mugs! Love the first one! I love your compositions and those beautiful blossoms! 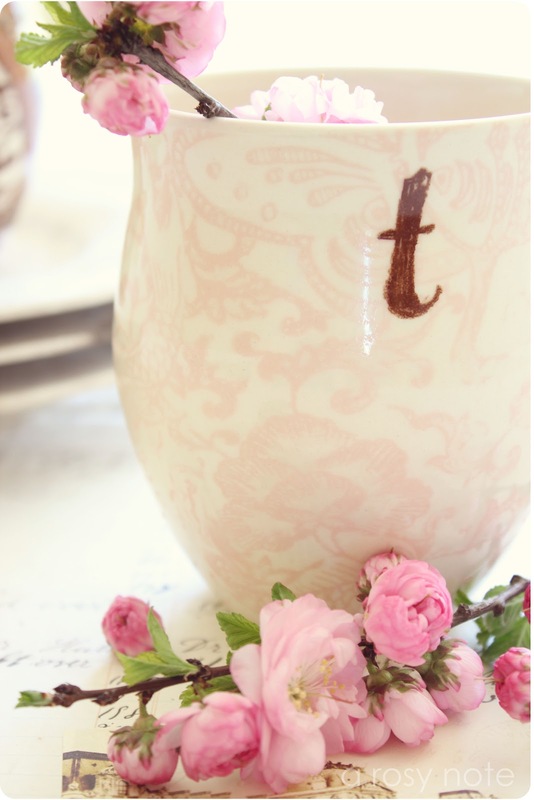 Hello Tricia, New to your beautiful blog…I must say that this post is so lovely! 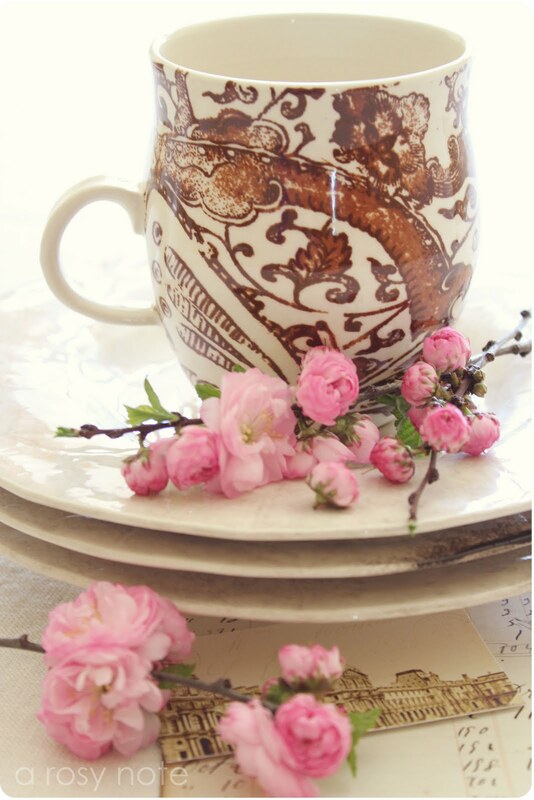 Congratulations on winning those beautiful mugs…love how you styled them with the blossoms! Ahhh. . brown and pink one of my favorite color combinations! Love the flowers! Beautiful Photos! aren't spring blossoms the best!? Gorgeous, gorgeous photos…love pink & brown together!! You have such a knack for putting together beautiful things and making lovely pictures. I always enjoy them! Your photo are fabulous. Love the faded color look. Lucky you! These are beautiful! Congratulations! What a great giveaway. I love the pink, brown and cream combo also. If only I had a girl to decorate for. My son wouldn't appreciate the pink part. Dearest sweet Tricia, those are really gorgeous mugs!! Congratz!! I too adore the gorgeous pink, brown and cream color combination! Your fluffy pink blossoms are sooo beautiful! Have a lovely merry happy week and love to you! Pretty things made even prettier by the way you photographed them! Gorgeous! I love the way you process your photos. Such a nice, vintage feel. Wasn't dissappointed in looking back through your posts, just Beautiful! Hi. I just found your sweet blog! What wonderful pretty things! Displayed and photographed beautifully! I hope to be back to read more of your blog. Thanks for sharing these gorgeous pink pretties! 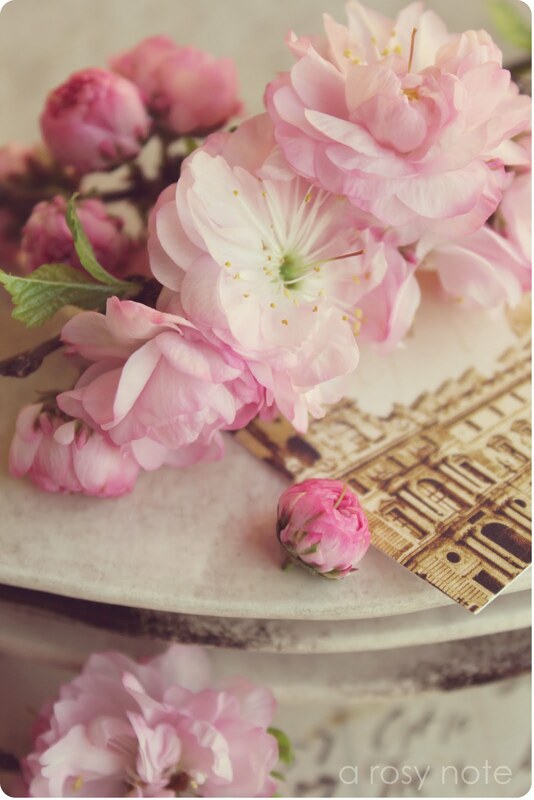 I love the way you mix fresh blooms with vintage and household items! Wow! Beautiful!! Pink and brown – wonderful combination.